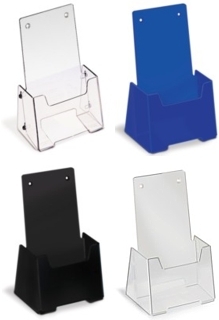 Our Clear and Colored Versatile Ship Flat Literature Holders are High Quality, Durable Units to Hold and Dispense Your Literature, Brochures, Cards or Other Promotional Materials. These Flexible Literature Holders are Strong and Lightweight While Being Nearly Impossible to Break. They Ship Flat Which Reduces Shipping Costs, Store Flat Which Minimizes Storage or Packaging Space, and Can Be Used For Countertops or Mount to the Wall For the Ultimate in Versatility.